In March 1987, William McKinley was inaugurated as President of the United States. Being in favor of the annexation of Hawaii, on June 16, 1987, McKinley and three representatives of the government of the Republic of Hawaii—Lorin Thurston, Francis Hatch, and William Kinney—signed a treaty of annexation. 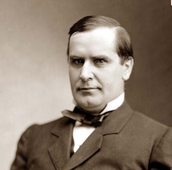 President McKinley then submitted the treaty to the U.S for ratification. Soon after the overthrowing of the Queen, the Committee of Annexation made themselves the Provisional Government. 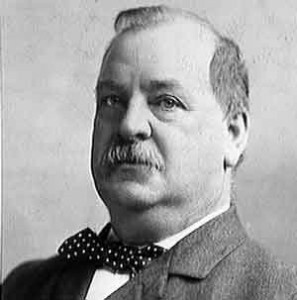 President Benjamin Harrison signed a treaty of annexation with the new government, but before the Senate could ratify it, Grover Cleveland replaced Harrison as president and subsequently withdrew the treaty. 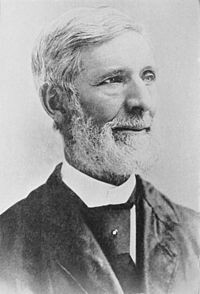 Shortly into his presidency, Cleveland appointed James Blount as a special investigator to investigate the events in the Hawaiian Islands. 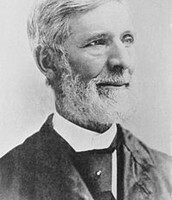 Blount found that Minister Stevens had acted improperly and ordered that the American flag be lowered from Hawaiian government buildings. He also ordered that Queen Lili'uokalani be restored to power, but Sanford Dole, the president of the Provisional Government of Hawaii, refused to turn over power. On January 14,1893, concerned about America’s territorial interests in the Pacific, Minister John L. Stevens met with American-Hawaiian business men, Stanford Dole and Lorin Thurston to plot in overthrowing Hawaii’s Queen and making her country their own. When Queen Lili’uokalani attempted to draft a new constitution, restoring the power and rights to the native Hawaiians, the Committee of Annexation countered it, Minister Stevens being a major supporter. Armed with a contingent of Marines from the warship, U.S.S. Boston, the Committee of Annexation, along with Minister Stevens overthrew the Queen in a bloodless coup de tat on January 17,1893. The annexation of Hawaii in 1898 was caused by the conflict between Spain and America in countries like the Philippines. With Hawaii being an ideal strategic location in the middle of the Pacific ocean, the islands were annexed by the urgent request of President William McKinley. Him along with President Grover Cleveland and Minister John L. Stevens all played very important roles during this time, changing Hawaii’s way of life forever. This topic is important i history because it shows just how far a country will go to fulfill their own personal needs.The United States of America, the land of the free and home of the brave, sworn to protect other nations from the bullying empires, subsequently took a whole race’s culture, religion and way of life, just so they can have a strategic piece of land in the middle of the ocean. This goes to show that maybe the “good guys” aren’t so good after all. What I want the reader to take away from my project is that the Hawaiian Islands were forcefully annexed into being a part of the United States. They were conned, cheated on and ruthlessly tricked into thinking they were doing this for the good of their people. Once they figured out what was going on, it was already too late. 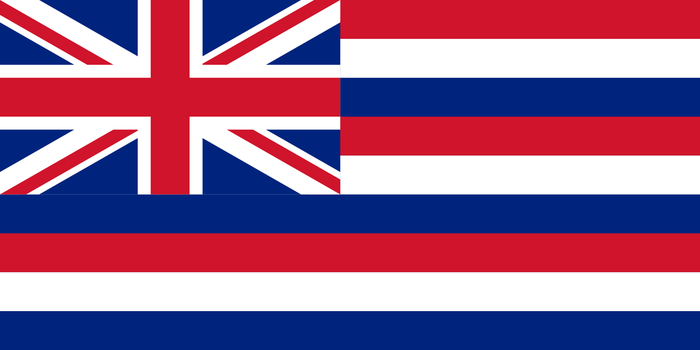 Is Hawai'i legally and lawfully a state of the Union? My answer would be no, Hawai'i is not legally and/or lawfully a state of the union. They were forced to become one even when they didn't want to be. They tricked the monarchs into giving up their land, their power, and their freedom. But even after all they've been through, the Hawaiian people still prevailed. 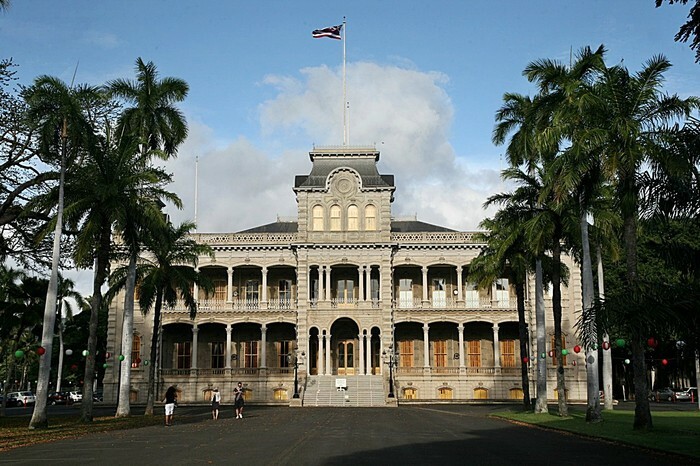 The picture to the far left is a picture of the Hawaiian flag, in the middle, Iolani Palace, and to the far right, a statue of Kamehameha I. "Annexation of Hawaii." Annexation of Hawaii. N.p., n.d. Web. 04 Mar. 2015. Merriam-Webster. Merriam-Webster, n.d. Web. 05 Mar. 2015. "The Queen and the Clevelands (Grover and George…)." Julia Flynn Siler. N.p., n.d. Web. 05 Mar. 2015. "History-Twisters in Legislature Want to Rip the Treaty of Annexation Out of the Hands of President McKinley's Statue." History-Twisters in Legislature Want to Rip the Treaty of Annexation Out of the Hands of President McKinley’s Statue. N.p., n.d. Web. 05 Mar. 2015. "John L. Stevens." Wikipedia. Wikimedia Foundation, n.d. Web. 05 Mar. 2015.